For a quick list of local businesses that offer great rainy day activities, check our Rainy Day Listings. Most Outer Banks vacations revolve around the great outdoors, with miles of undeveloped beaches to explore, dozens of watersports, and plenty of activities that thrive under the sun. But even a sunny vacation destination like the Outer Banks experiences a rainy day every now and then, so when the weather drives you off the beach, spend a day exploring these indoor and rainy-day friendly Outer Banks activities. The North Carolina Aquarium in Manteo is a perfect kid-friendly destination for rainy afternoons. Tucked along the soundside on Roanoke Island, the 68,000 square foot aquarium greets visitors with a Croatan Sound overlook and fossil pile that's open for digging. Indoors, visitors will be delighted by a series of colossal and exhibit-filled rooms showcasing North Carolina's bountiful marine life. From sea otters to alligators, turtles to Trigger fish, the aquarium is well stocked with both local and tropical species. The aquarium offers a variety of interactive activities, including a marine lab where kids and adults can learn how to care for threatened species, and a touch tank, where visitors can get hands-on with manta rays and prehistoric horseshoe crabs. 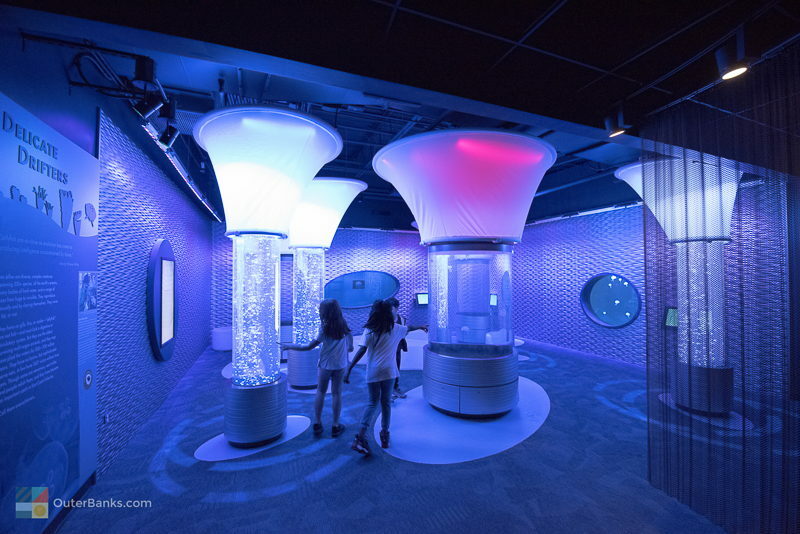 A "Hurricane Room" covers the Outer Banks extensive and tumultuous relationship with hurricanes and Nor'easters over the centuries, and an exhibit on inland marine life features turtle, reptiles, and boisterous sea otters at play. Perhaps the biggest attraction at the aquarium is the giant 285,000 gallon ocean tank, the largest aquarium tank in North Carolina. In the dimly lit room where the 14 ft. tall tank is held, visitors can watch large species, including sea turtles, drum, and even sharks, quietly maneuver in a watery replica of their home just a few miles offshore. Feedings take place regularly, so visitors can watch the trained divers brush up against the sharks, and special educational sessions take place in the spacious exhibit room throughout the day. The North Carolina Aquarium also features a gift shop with plenty of aquatic toys, games, books, stuffed animals, shirt, and souvenirs. The aquarium is open daily all year long, from 8:00 a.m. - 5:00 p.m. There are a number of museums for all tastes on the Outer Banks, from the Wild Horse Museum to the eerily fascinating Graveyard of the Atlantic Museum in Hatteras Village. 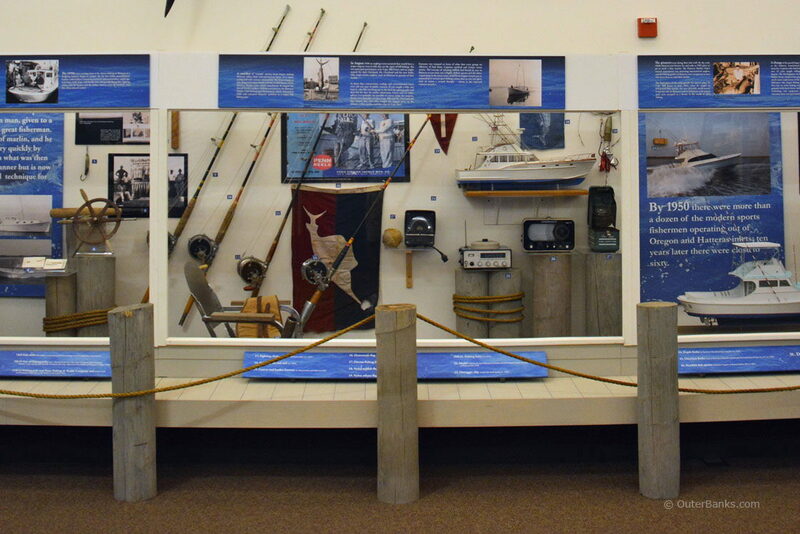 The museums on the Outer Banks focus on a range of local culture, wildlife and history, and many offer special programs for kids and adults throughout the year. Come watch a documentary about the legendary Blackbeard at the Blackbeard Pirate's Exhibit in Ocracoke, or learn how to fly a 1903 glider at the Wright Brother's Memorial. Whichever museum your family decides to explore, you'll get an in-depth perspective on what makes the Outer Banks such a unique vacation destination. Many museums on the Outer Banks can be accessed for a small fee, or are free to the public with a small suggested donation, and are open daily year round. 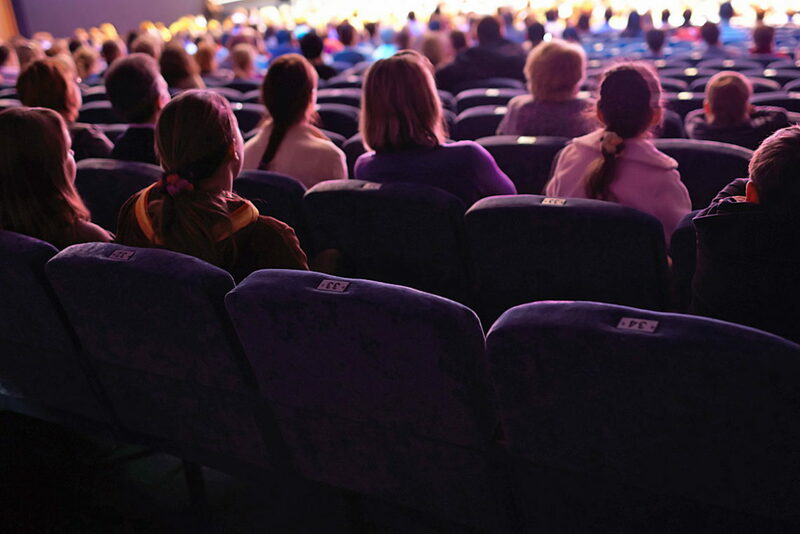 Rainy Days are ideal for taking in a summer blockbuster, and the Outer Banks has a number of movie theaters scattered throughout the area. An R/C Movie Theater in Kill Devil Hills features 10 screens, concessions, and a game room area, ideal for rainy afternoons. One of the most unique theaters on the Outer Banks, however, is the Pioneer Theater in downtown Manteo. This theater tucked along Budleigh Street and identified only by its unique Tudor exterior and a small hanging sign, is the oldest theater that has been run by the same family in the United States. The theater originally opened in 1908 a block away from its current location. In 1934, the theater moved to Budleigh Street and has remained in operation ever since. The interior of the Pioneer Theater has been carefully preserved and remains in its 1934 pristine condition, allowing theater goers a chance to go back in time while they watch the latest blockbuster. With only one screen and no reclining seats or cup holders, the theater may seem small compared to Mega Multiplex standards, but the Pioneer Theater is definitely worth a visit for its historic claim to fame and old school ambiance. The Outer Banks is truly a shopper's paradise. From those sought after souvenirs to take back home to beach-worthy bikinis and sun dresses, there is no shortage of decadent boutiques, sprawling gift stores, and charming shops to check out on a rainy afternoon. Every town has its own unique collection of stores, distinctive to that community's character. Finding enticing stores to visit is an easy task, although there are several shopping centers and concentrations of stores on the Outer Banks for easy door-to-door browsing. 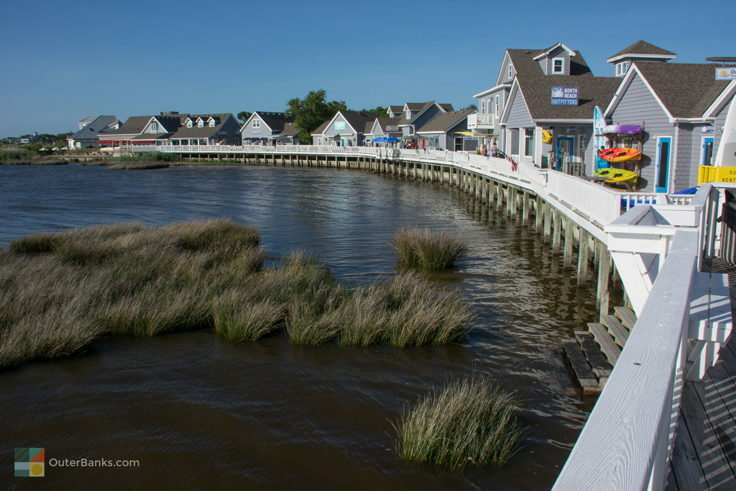 In Corolla, shoppers flock to the TimBuck II Shopping Village in the heart of the town, overlooking the Currituck Sound. This waterfront complex offers over 60 stores and restaurants, ranging from upscale boutiques to quirky game and puzzle stores, and is sure to fill a day of entertainment for any shopper. In Duck, the Scarborough Faire Shopping Village and Scarborough Faire Shops feature a combined total of nearly 40 stores and restaurants to explore in a quaint, boutique setting. Located under a canopy of Live Oaks and extending to the soundfront, these shopping centers incite a laid-back attitude for leisurely browsing in a tranquil, natural setting. The central Outer Banks towns of Nags head, Kill Devil Hills, and Southern Shores offer a variety of shopping center to choose from. Visitors have the option to visit small, beachfront plazas like the Surfside Plaza in Kill Devil Hills, for T-shirts and taffy, or they can up the ante at larger centers, such as the Tanger Outlets in Nags Head, which feature household name outlet stores such as Nautica, Coach, Polo, Gap, and more. In the central Outer Banks, the majority of larger shopping centers are located along the Highway 158 bypass, but don't discount the less-traveled beach road - this unpopulated stretch of highway has a selection of quaint souvenir and beach shops for seaside treasures to take home. On Hatteras Island, locally owned gift shops and boutiques are scattered throughout the island, with a handful of small plazas in every village. The southern end of the island is home to one of the area's largest shopping centers, the Hatteras Landing Shopping Center. Adjacent to the Hatteras Ferry Docks and Hatteras' cluster of marinas and boat docks, Hatteras Landing features a number of locally known stores, such as Birthday Suits and Kitty Hawk Kites, as well as seasonally open food stands and restaurants, and a harbor deli. While waiting in line at the ferry docks, or shopping away a rainy day, the Hatteras Landing shopping center is definitely worth a stop. It's no surprise that the picturesque scenery of the Outer Banks has inspired hundreds of local artists, and there are a number of local galleries that showcase their work. For a quiet rainy day excursion, pop into a local gallery or two and take in the beauty of the Outer Banks as filtered through the eyes of some of the area's best artists. There are several areas throughout the Outer Banks that are known for their collections of locally owned galleries. Historic downtown Manteo has a number of both galleries and antique stores ideal for exploring on a rainy day, and throughout the town visitors will spot a number of local art galleries sprinkled along US 64, the main road that runs through Manteo. In the central Outer Banks, art lovers can stop by "Gallery Row" in Nags Head, a small street that intersects the bypass and the beach road and is lined with locally owned art galleries. Parking is available at the individual galleries and along the side of the street as well for easy gallery browsing. For a longer excursion, take a day trip to Ocracoke Island. This community is renowned for its local artists, and a number of quirky shops and galleries can be found throughout the 4 square mile village. Take a stroll along Ocracoke Harbor or down historic Howard Street, one of the oldest residential areas in Ocracoke Village, and enjoy a collection of galleries featuring local painters, sculptors, jewelry designers, and potters, all from the coastal North Carolina area. Feeling crafty? There are a number of creative outlets on the Outer Banks to keep your family entertained on a rainy day. While driving along the Outer Banks, you may notice that a number of local coffee shops also feature large "Bead" signs, displayed prominently in their windows. 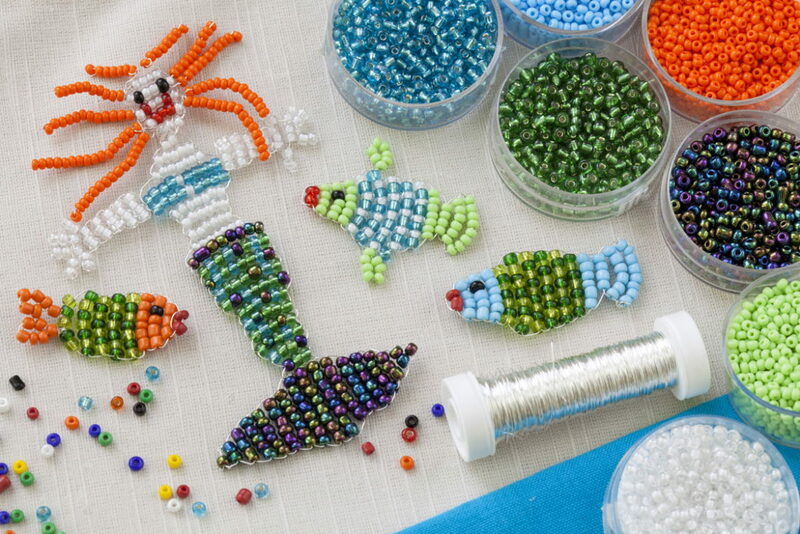 These shops offer a wide variety of beads and beading materials, from seed beads to sea glass to silver pendants, allowing patrons to grab a chair and a cup of coffee and create their own unique Outer Banks jewelry. Bring the teenagers along, as this crafty afternoon is ideal for older kids. There are also several Paint Your Own Pottery shops, including one in Duck, one in Kill Devil Hills, (which is also a bead shop), and one in Avon on Hatteras Island. These shops allow patrons to relax for an afternoon or a day and create their own pottery souvenirs to take home. Pottery pieces are fired and glazed on the premises, and can be picked up later in the week or shipped back home after your vacation. Several shops also feature evening painting lessons or special programs on unique crafting projects, such as ceramic tile mosaics. Bring everyone in the family along - even the little ones can enjoy grabbing a brush and making their own piece of Outer Banks art. A number of local galleries and businesses also offer watercolor or painting classes. Special programs are featured seasonally and are available by reservation on a variety of different techniques, from painting seascapes to capturing local plants and flowers. As an example, the Elizabethan Gardens on Roanoke Island offers a number of painting classes, from afternoon sessions to two day workshops, and visitors and Elizabethan Garden Members are both welcome to attend. On Hatter Island, Hatteras Realty offers weekly watercolor classes in the evenings from Memorial Day to Labor Day for vacation rental guests as well as Hatteras Island visitors. Check out your local Outer Banks galleries for guidance on where and when classes are available, and remember to try to book your class in advance, if possible. 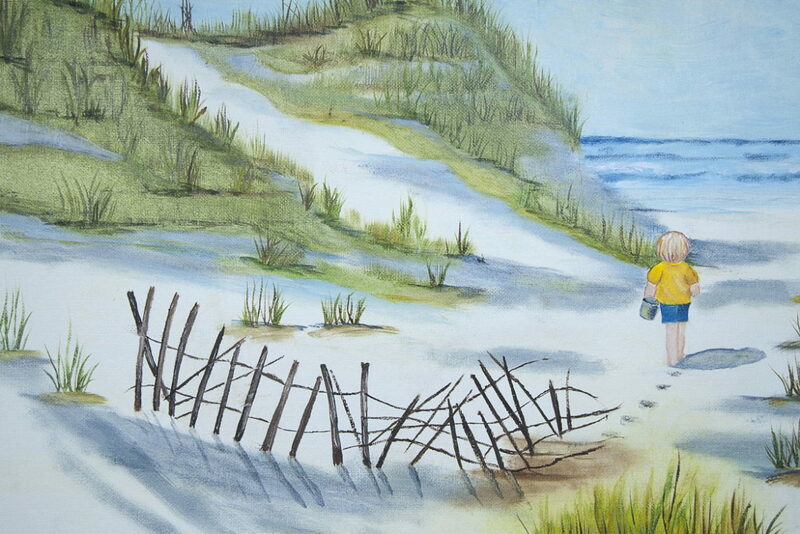 A rainy day of crafting or painting can be very popular on the Outer Banks. No vacationer wants a rainy day during their Outer Banks retreat, and thankfully with the temperate climate that coastal North Carolina enjoys, those washed-out beach days are generally few and far between. But just in case a little dose of bad weather puts a damper on your beach plans, there are plenty of activities and attractions to keep your family entertained all along the Outer Banks, from the quaint shops of Corolla to the art galleries of Ocracoke. Even where the weather is perfect, all of these rainy day options can create a fun-filled afternoon on the Outer Banks. Experience unmatchable sportfishing on the Outer Banks! The Outer Banks, also referred as ‘the Billfish Capital of the World’, offers some of the world’s finest OBX sportfishing and the most preferred game fish. Treat yourself to an on the water experience by reeling in yellowfin tuna, dolphin (mahi-mahi), wahoo, marlin, sailfish and bluefin tuna. The Outer Banks has its fair share of attractions for vacationers, including the Wright Brothers Memorial, 4 famous North Carolina lighthouses, the NC Aquarium, the Lost Colony, and enough shopping and dining to keep any family entertained for a week-long vacation. But the biggest attraction that draws seasoned Outer Banks vacationers back every year are the miles and miles of pristine beaches.